Summer seems to have finally arrived in the Mother City. We have had so many false starts and empty promises so I am very happy to see it! Last week was a rather busy week, I am currently juggling multiple clients, multiple projects and of course life. By the time Friday arrived I was ready for a bit of down time, however like all good intentions, we had little or no rest on the weekend. Saturday I had a ridiculously long list of errands to run. I normally send the kids or Norm, or go with them, and I realised just how long it has been since I toddled off on my own to do anything! To be fair I did kick off with needing Caitlin’s help to choose the platters for the party. We normally always order from Pic N Pay, but their deli order process is so disorganised and it is such a pain in the arse to get over to Constantia and park our car on a Saturday that when a friend mentioned that our local Spar does party platters I thought it worth a try. I often hear people talking about the hot deli there so figured it can’t be that bad! I’ll let you know next weekend. We ordered about 6 platters and then I went off to finish my shopping. I got home just in time for Norm to do a quick change then off we went to a braai at Darryn and Kerri-Ann. They have a lovely home on the other side of the valley; it felt so private and secluded. We took Navajo with us as he still cannot be trusted home alone. It took him a few minutes but eventually the dogs all settled and had fun together. Kerri-Ann’s rescue dog initially kept baring her teeth at Navajo, but he was oblivious of any tension and kept just licking her snarling face. She eventually gave up and decided he was harmless despite his size. We had a few glasses or wine there (well I did as Norm was driving of course) and a chat to the Shepley’s whom the braai it was in honour of. We then had to shoot off home and get ready for the next stage of the evening. We were meeting some twitter friends and Caitlin and her new fella. It was his first time to meet any of the family and it was both Caitlin and Justin’s first time trying the food at La Mouette. There were 10 of us and the host asked if we were happy sitting outside, or whether we would be happier upstairs. It was the most stunning evening, the weather was perfectly balmy and warm, with no gusts of wind which is normally the spoiler in Cape Town so we opted for the courtyard. The tables were all set with crisp white linen and each chair had a bright blue throw in case we were chilly. The accents were all blue and it looked fresh and stunning. We had some delicious Professor Black Sauvignon Blanc from the Warwick Wine Estate. It is my go to wine at La Mouette and I seldom even bother with the wine list. And yes I know if I am having red meat I should have red wine. But I should do a lot of things. I generally don’t do as I am told. I coached Caitlin and Justin to try and not over analyse the contents of the items on the menu. If you do read the fine print of the course description you will think, what is THAT? And why would I eat it with THAT? Welcome to the La Mouette rooky mistake….don’t think, just experience. 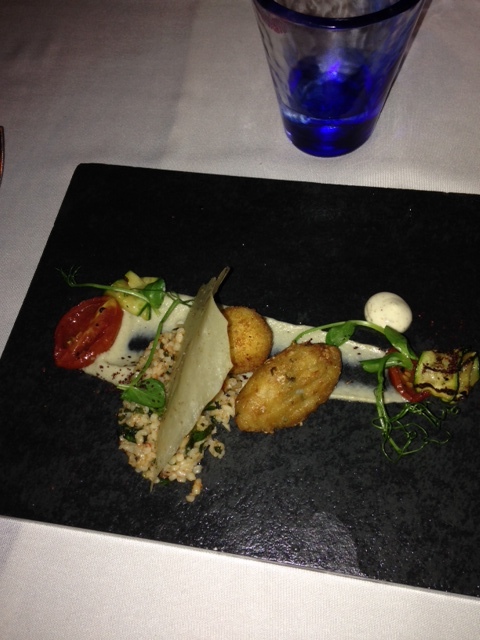 Mezze Goats cheese croquette, falafel, tabbouleh, smoked aubergine puree, grilled baby marrow and sumac. Next, Caramelized onion soup Brioche croutons and fontina tortelinni. This had tons of flavour and a perfectly cooked little tortellini. 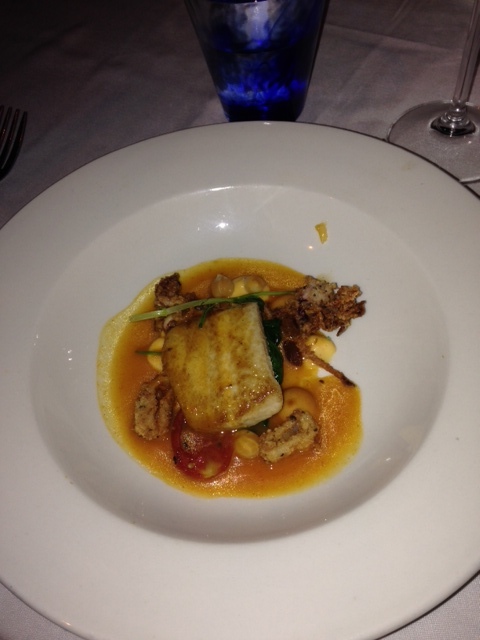 Pan-fried line fish Chick pea puree, red pepper emulsion, raisins, calamari, baby spinach and smoked paprika. The cheese course was a sort of ‘deconstructed’ ‘Waldorf’: Gorgonzola croquettes, celeriac puree, marinated grapes, radish and pickled apples. Dessert was Spiced coconut panacotta Coconut crumble, passion fruit gel, pineapple foam, tamarind grante and toasted cashew nuts. and the lamb, even though I often say I do not eat lamb, when I am at La Mouette I make an exception. It melts in your mouth and is so full of flavour, I just can’t pass it up. The ‘Waldorf’ cheese course was heaven. Don’t get me wrong, it is all pretty damned heavenly, but that course was un-freakin-believable. And the one I looked forward to the least! I’m not a fan of celeriac (actually just WTF is celeriac? I thought that was that disease of the intestines which meant wheaty stuff made you ill….or is that celiac?) I do not like fruit in savoury foods, so the apple sounded a bit too appley. Add in a radish and what you smoking in that kitchen Chef Henri? Whatever it is, smoke some more because wow! You had to try and get a morsel of each of the ingredients into your mouth at once and the combination of the flavours was simply perfection. The crisp tart apple, the bitterness of the radish, the smooth creamy cheese…and there were these candied walnuts on the plate which were the perfect finishing taste. As we were sitting outside it became difficult to snap pics as it was all romantic and candlelit – add to the fact I am blind as a bat and then you won’t criticise my artistic endeavours quite as viciously as you might have otherwise. 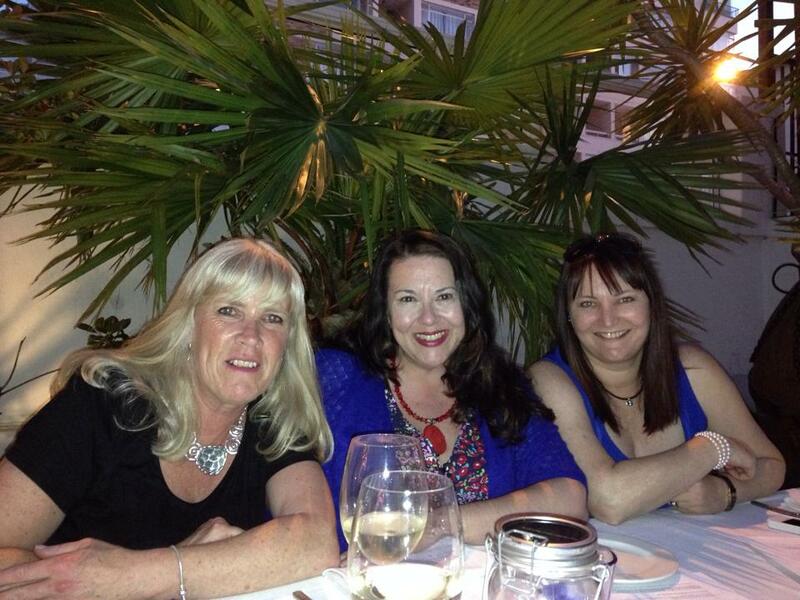 We did manage to get a decent snap of me, Retha and Diane. We had a brilliant night, a lot of laughs, amazing food and a bit too much wine. As a result, on Sunday I woke feeling a bit tender compliments of the Professor. But we had plans to entertain that evening, so I managed to persuade Norm to shop for me and I made a huge pot of very spicy chilli con carne and rice. It was a stunner of a day, so I spent most of it lying in the shade by the pool, playing candy crush while dangling my toes in the water. We brought out the paddling pool for Navajo and he had a blast running and jumping in, getting soaked and then running round the garden like he was possessed. Later that evening we had our DJ for next week, Baz and his GF Candi round. We all hit it off as if we’ve known each other for years, not just met. We chatted and munched and sat outside in the garden until they left. This was the 1st time we had entertained this year as the weather has been so erratic. It is the 1st time we have sat comfortably in our back garden since our home invasion. I have to confess I was still probably a bit jumpy on occasion as my back was the wall where the guys entered our property. But that in itself is progress, I wasn’t able to even sit with my back to the garden for months. Slowly slowly we get back to normal. Today I decided to have left over chilli con carne for lunch and I had a strong craving which even to me sounds bizarre. When I was a child at school they would serve chilli con carne with peanut butter sandwiches. No lie. Now this is another one of those things which sounds like it could never make sense but it really does. Or maybe this is just that my taste buds stored this memory under the category of ‘home’? I heard the other day that if a puppy is exposed to most things before it is 11 weeks old then it will not be spooked. So maybe peanut butter and chilli is my childhood dog training? Whatever the reason, it makes me feel comforted. The rest of the week flew after Rihanna. My neck and shoulder were in spasm so I emailed an osteopathy dude I had heard about and he just happened to have an appointment for me Friday afternoon during lunch hour. Funny how the Universe literally had my back. It was the first time I had ever been to an myosteopath and was really impressed with the treatment. It is like the Bowen Technique and McTimmoney Chiropractic technique had a baby technique. Some deep acupressure, some reflexology moves, some stretching, some flicking (like in McTimmoney). I left feeling almost high from the released energy coursing thorough my body. I met my friends Dawn and Chris and their daughters for cake and coffee at Hout Bay Manor. The cake on special was black Forrest, a dark chocolate gateaux with cherry filling and a creamy frosting. We ended up having 2 rounds of coffee and tea as we were having such a good chat. Seems ages since I saw them all and it was the perfect kick off for the weekend. Friday the family were all home so we rented The Hangover 3 and had take aways from Cassarechio. They do some amazing pasta dishes. I had the Prawns Gamberi on Friday. It is a creamy tomato garlicky sauce with lots of big prawns. One of my faves from there. Saturday I woke to find my neck and shoulder were seized up again. I was supposed to go to the local superspar to see about ordering some of their platters for my Halloween party. But I decided that could be done during the week. Caitlin and I were due to go to the hairdresser at 1 and she was going to a friend after so couldn’t give me a lift home. Norm kindly offered to come to collect me after so off we went. I had a lovely neck massage and it helped a bit. My hair got lots of red highlights, I love it. Poor Norm had to race home, drop me, then head off to his puppy training with Navajo. When he got back he looked exhausted so I suggested we go a bit late to the party we were attending. We both nodded off but luckily Lily woke us or we would have probably slept all evening! We got ready and headed out to Re:Public, starving! The kitchen was closed so we just popped in and said hello to everyone and birthday girl Lee, then popped round the corner to Papino’s for a fillet steak. Their steaks are always tender, with no icky bits, and come with a nice variety of carbs and al dente veggies. They also do a fried mushroom side which is simply mushrooms fried in butter and garlic which I love with steaks. We then went back to Re:Public and chilled with some new friends from Hout Bay Organised our local Face Book group. There was a DJ and dancing but it was so hot in there that it was unbearable so we had to duck without dancing. Today we are just relaxing at home. Norm and I are cooking. I am doing a roast gammon, sweet potatoes roasted in coconut oil, glazed carrots and Norm is doing potato dauphinoise. He also bought a yummy chocolate dessert so that should round it off nicely. My weekend has been full of family, friends, good food and good times in a beautiful environment. I feel very blessed. Life is on that downhill slide to the end of the year when most of South Africa shuts down. Not like the same sense as the USA shut down, cause that is just silly. Our shut down just involves, sun, sand and sea…and a bit of wine. OK probably a lot of wine, but we do live in the wine route so that is to be expected. The result is that everyone is tired – many of us have not had time off since last year. I am an exception as I had 3 months of sick leave with my hip op, but that was hardly a vacation! I find from October the world is a whirlwind, planning for our big Halloween party, making plans and shopping for Christmas, and then on top of that maintaining our normal busy social life. 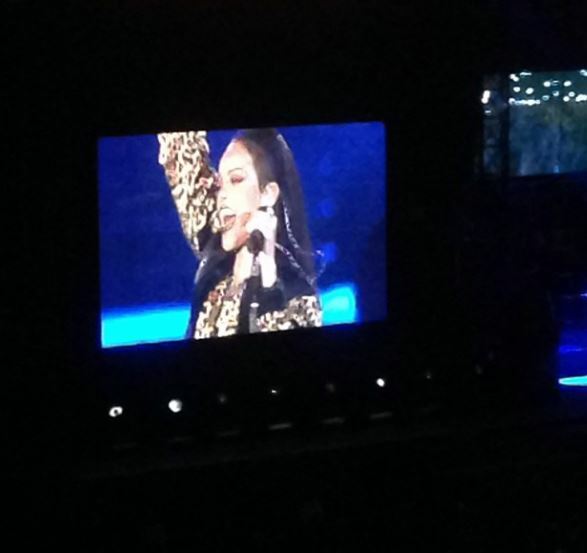 Last night we went to the Rihanna concert in Cape Town and the Stadium. 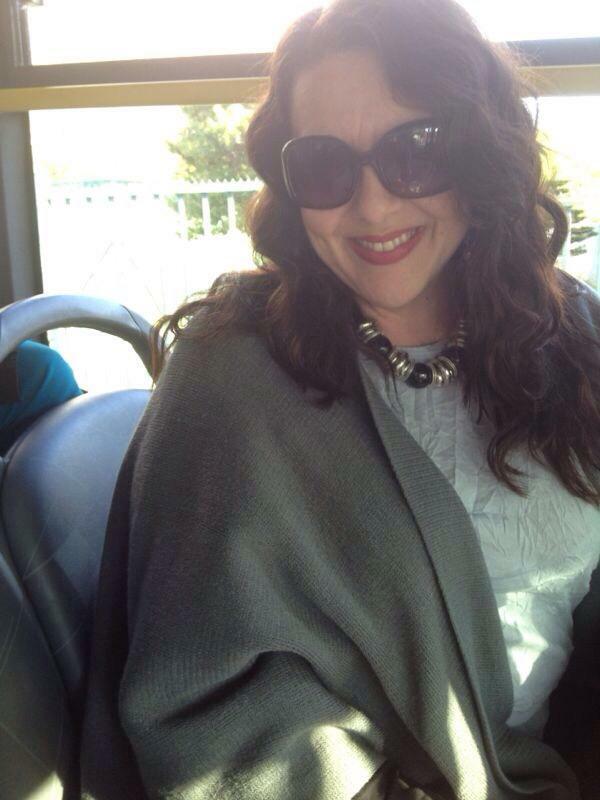 The City of Cape Town arranges a shuttle service but we generally have rotten timing when it comes to catching one. For the Red Hot Chilli Peppers we had to stand and wait for over an hour and ended up missing the opening act. Yesterday we arrived just as one was leaving but there was another pulling in so we got very excited until we boarded and realised we were the 1st to board and would have to wait for it to fill up before it departed. But at least we were sitting! We used the time as an impromptu photo opportunity. 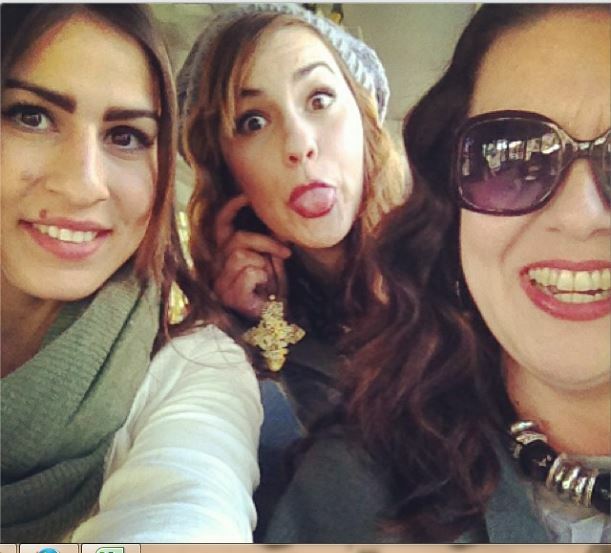 The girls and I were taking lots of silly snaps which made the bus driver think we were lunatics. Eventually we made it into the city, the view of the sea along the coast road is amazing from a bus as it is so high up you get a different perspective than from a car. We arrived to find Norm already there and grabbed a bite to eat and headed to our seats just as GTA started their set. The music was good and we had a lot of amusement watching the people in the standing section dance like crazy people. Rihanna came on the stage pretty much on schedule, and I thought the show was brilliant. A lot of negativity had been floating about the twittersphere about the Johannesburg show, but no diva behaviour here in the Mother City. 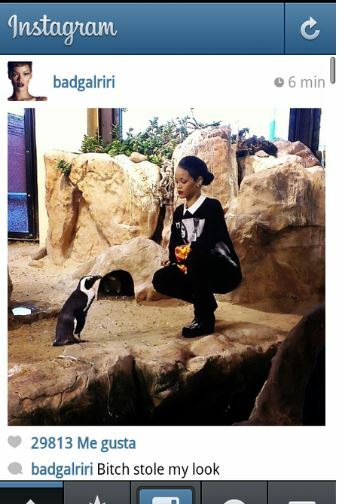 Rihanna said her family were here with her and based on her Instagram pics she was having a fine time playing tourist. This caption made me laugh as I adore Fashion Police. She looked happy to be here performing. As always when I attend anything where other humans are allowed, we had a wee bit of drama. I tend not to play well with others. There were 2 guys sitting behind us who had a very loud conversation throughout the entire 1st part of the show. I have never understood people who attend a show of any kind and then natter all the way through it? This highly annoyed them so they then proceeded to shout in Afrikaans for us to ‘dance you f*ck$#s’.